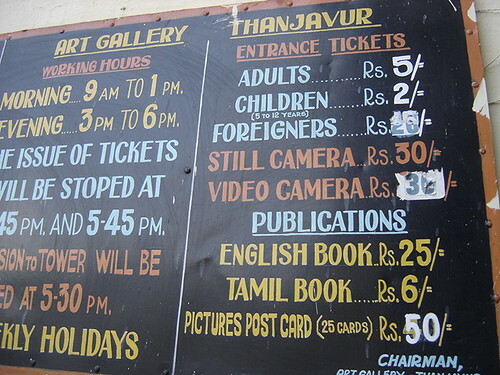 Thanjavur Art Gallery, originally uploaded by jrambow. One of the nice details about India are that almost all signs are handpainted. They may not always be accurate, but they're usually pretty. The art gallery, by the way, was amazing, and it made me wish that my knowledge of Chola bronzes wasn't so sketchy. The gallery is part of a palace complex, and by the time I'd reached this point, I'd gotten tired of paying my "foreigner" fee and my camera fee at every little exhibit. They have really got to get it together here and have some sort of ticket that includes everything. As it was I saved my 30 rupees and decided not to take pix of any of the amazing art inside. But why didn't I buy the "English book"? I bet that was good too.